In Part 1 the importance of and decision when to play the role of the heat shield were discussed. 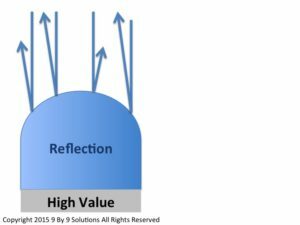 This post looks at how to perform the role of the heat shield in a professional manner in order to maintain the leader’s effectiveness in the organization. To understand this action, it is best to consider how a heat shield works in space. Note two critical statements in the description above. 1. Heat shields are blunt objects. They are passive instruments, not active. Heat shields are not designed to attack but rather to protect by serving as cushions. They do put themselves in the path of heat. Effective leaders seldom look to initiate conflict but when heat occurs they look to dissipate it in the least intrusive manner possible. 2. Heat shields diffuse heat. There are ways to dissipate heat and one style that should generally be avoided. 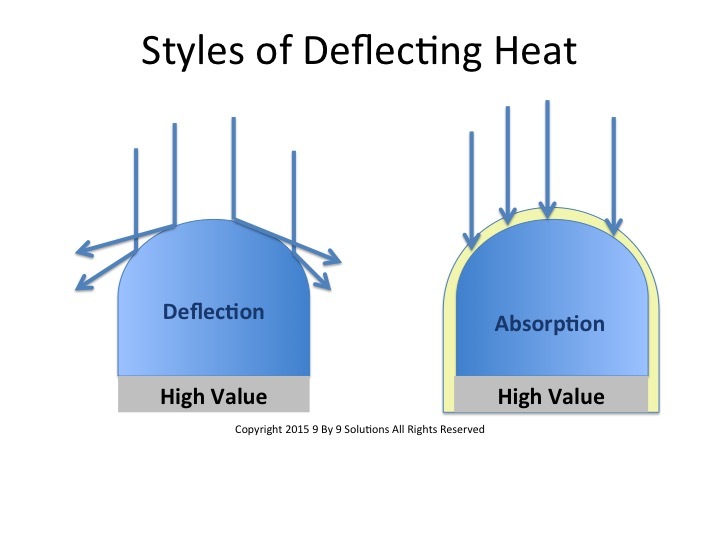 Heat shields diffuse and spread heat to lower the concentration of heat in a given area. They deflect heat over a broader surface area and move heat to the periphery. 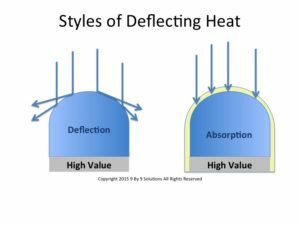 Deflecting heat involves dissolving pressure into smaller fragments so that a decision can be made on how to address (or ignore) each smaller issue. This may require the leader to redirect the scrutiny toward high value (always the best option). It may involve sharing data that puts the issues being addressed in a proper perspective. Finally, if the heat will not go away, it may mean securing additional resources to address the low value concerns. Whatever the option, the goal is to protect critical resources that stay focused on high value. Absorbing heat means pressure is focused directly on the heat shield. In organizational life this requires the leader to have a personal insulation layer that allows the absorption of heat. This layer is composed of a conviction around the value being created and that the value will ultimately be worth the risk. The layer is necessary to allow heat absorption without the leader taking the heat personally. Absorption may be used as a primary style or it may follow an unsuccessful attempt to deflect heat. If used, it may require the leader to do low value work herself. It may mean the leader directs the spotlight inward as the one who is responsible if the value is not delivered. Ultimately, it means the leader serves as a lightning rod instead of staff. Whatever the approach, the result is the same: heat is directed away from high value but, in this case, the heat is directed to and absorbed by the leader. Obviously this approach inflicts a high personal cost on the leader. Being a successful heat shield requires skillful leadership. The heat shield does not attack. It is blunt, not pointed. It does not set out to make enemies in the organizational hierarchy. The cardinal principle for a heat shield leader is “protect high value today but live to fight another day”. 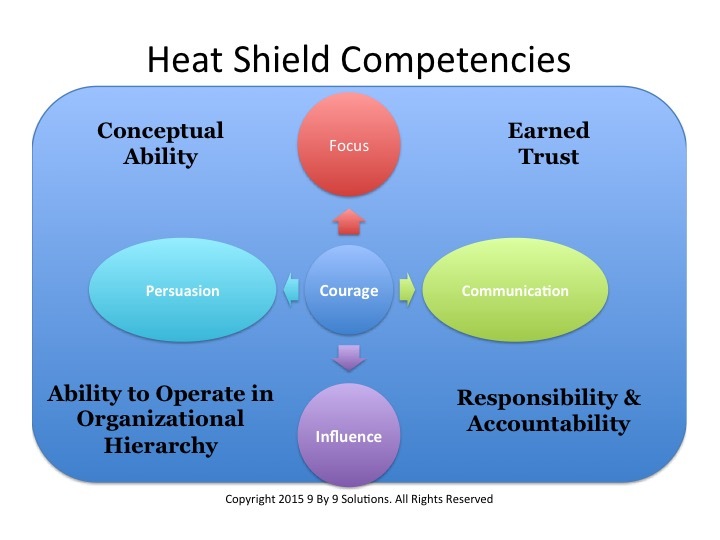 This requires the leader to integrate several critical competencies to successfully perform the role of heat shield in an emotionally intelligent manner. Success for us mere mortals (unlike Steve Jobs, et. al.) requires courage to take a stand on high priorities (focus). (Taking a stand on low priorities only creates a reputation of being hard to work with and out of touch). The leader must persuasively communicate his or her reasoning with data and logic so as to influence others toward the desired direction. This requires seeing the bigger picture (conceptual ability); it requires that the leader’s reasoning, logic and thinking be made visible; and, it also requires having a network of supporters inside the organizational hierarchy. It means being willing to take responsibility for results that are ultimately delivered, because a day of reckoning always occurs. Finally the leader who will be successful in this area must have built a reputation of trust (based on integrity and delivery of past successful results). 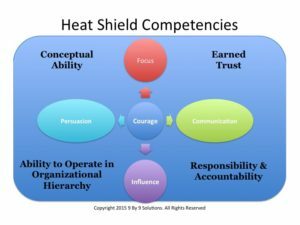 These competencies must be developed and in place long before a need to play the role heat shield occurs. They vent or let off steam to their boss about the organization and the “idiots higher in the food chain”. When this happens, the leader must determine if it is appropriate to share that information up the chain of command. It can be very damaging to an employee (and to the leader) to communicate information above when that “heat” and only serves to heighten tension. One critical role of the leader as a heat shield is to determine what and when to pass up the chain of command or when to simply “absorb” it. (Deflection of heat received from employees is generally not a good idea since it often serves to point a finger of blame elsewhere in the organization.) It is interesting that much of the heat that the leader absorbs and which ultimately results in leader burnout comes from the staff level. Interestingly enough the same questions and decision tree (Part 1) provide guidance in making the decision. As I read Tim Cook’s comments about the leader’s role as a heat shield, I was reminded of a leadership role I once held. My team was responsible for revenue production in a company with an aggressive growth plan. Each Saturday morning there was a conference call with all the team leaders and our boss to discuss the status of revenue produced over the past week. The calls often turned into a berating session: not enough revenue; not enough effort; working on the wrong things; taking to the wrong buyers, failure to maximize opportunities. It dawned on me after a few meetings that I had to decide how to deal with the negative feedback I was receiving. If I believed in the direction my team and I were pursuing, I had to allow time for that effort, energy and plan to take root. In that case, passing “heat” down the chain would be counterproductive. If I was not confident in the direction, then I had to work with the team to develop a new direction and plan immediately. In either case, allowing the dissatisfaction (heat) I was hearing to cascade down the chain of command made no sense in terms of achieving results. Playing the role of a heat shield carries with it a heavy toll. There are two significant costs to the leader who plays the role of heat shield on a continuous basis. First, in this age of super transparency, a leader is often criticized for not being open and sharing everything they know. Both superiors and staff become upset if what they consider important information was not shared. 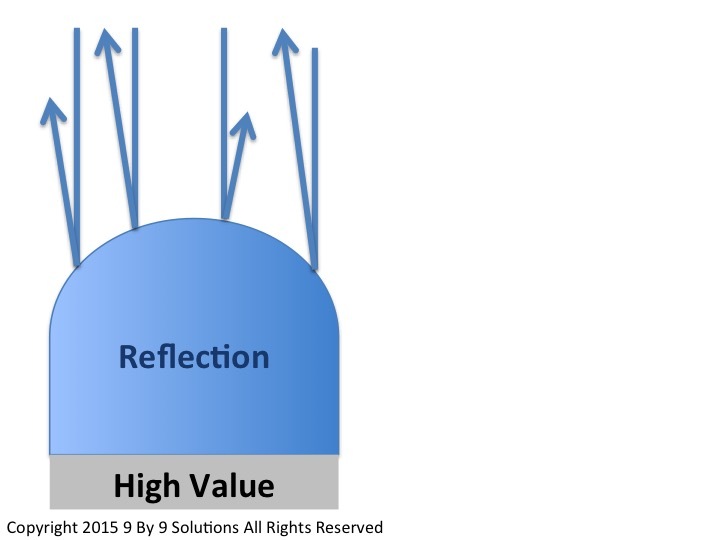 The bottom line is that successful leaders must deflect heat in both directions. They do so to ensure that both short and long term performance can be accomplished and that working relationships are preserved. Making a decision about what to share and when to share it is not always easy. Whatever decision leaders make often opens them up for criticism. Second, heat shields burn out. In space, heat shields cannot be reused for consecutive missions without extensive retooling. In organizations, heat takes a toll on leaders. Unfortunately leader revitalization is seldom considered. Staff may never know that the leader has deflected criticism, complaints or pressure away from them so that they can perform essential work but the toll on the leader is real. As a result, one of the most high emotional energy and important tasks the leader ever performs goes unappreciated. Leaders who continually work in the heat and spend their time deflecting it eventually come to one of two decisions. 1. They decide the effort is no longer worth it and quit playing the role of the heat shield. They simply “play the game”. 2. They come to the realization that they can no longer take the wear and tear that this role is inflicting on them. As a result, they leave their jobs and even organizations to escape the wear and tear they experience. Leaders should not seek to be heat shields but when it is required they must be willing to play the role in an emotionally intelligent manner. As with many leadership actions, the leader cannot choose the situations they are dealt. Neither can they choose their actions based on what will be applauded (above or below them). The decision to act must be based on what is right. The dilemma is that doing the right thing may cost a leader his or her reputation, respect, job or health.